The online offensive against the Westboro Baptist Church continues to gain momentum. The Twitter accounts of two prominent members of the hate-mongering group were apparently infiltrated this week by members of the infamous hacker collective UG Nazi. On Monday, Wired.com confirmed that 15-year-old whiz kid "Cosmo the God," a prolific member of the UG Nazi "hacktivist" group, had successfully carried out a takeover of @DearShirley, the Twitter account opened by WBC spokeswoman Shirley Lynn Phelps-Roper. Phelps-Roper apparently sent her last authentic tweet hours after the Sandy Hook tragedy, announcing that the controversial group planned to picket outside the funerals of Newtown victims. Cosmo broke into the account on Monday morning, changing Phelps-Roper’s background to an illustration that said “pray for Newtown” and editing her profile information. Several hours after the takeover, Twitter finally got wind of the hack and suspended Phelps-Roper's @DearShirley account. But before it did so, UG Nazi, according to Gizmodo, managed to wreak some havoc, tweeting out a link to the woman's phone number, posting a White House petition to recognize the WBC as a hate group and posting a number of tweets celebrating the account's takeover. On Thursday afternoon, Twitter had apparently restored @DearShirley, but the account hadn't yet been scrubbed of the remnants of Cosmo's romp. The hacker group did not stop there, however. On Wednesday evening, they set their sights on the Twitter account of Fred Phelps Jr., son of the church's vitriolic leader, Fred Phelps. 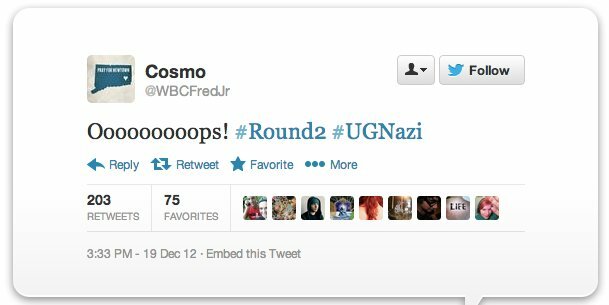 According to Wired, Cosmo and UG Nazi took over @WBCFredJR "via Phelps’ Hotmail account, which he gained entry to by forwarding the password-reset phone number on the Hotmail account to the phone number he controlled." The account was suspended some time after that; it was still unavailable on Thursday afternoon. The Kansas-based Westboro Baptist Church, described as a "homophobic and anti-Semitic hate group" by the Anti-Defamation League, has gained notoriety over the years for picketing funerals of U.S. soldiers, children and AIDS victims. Previously, the group has also threatened to picket the funerals of victims of the Tucson, Ariz., shooting and memorial services after the Aurora, Colo., movie theater massacre. This recent wave of "hacktivism" against WBC followed in the wake of vows made by the group to picket vigils and funerals planned for the victims of last Friday's Sandy Hook Elementary School shooting. The hacker backlash began in full force earlier this week, when prominent hacktivist group Anonymous promised retribution and later published a list of personal information about WBC members. Anonymous also took credit for knocking a WBC website offline temporarily and for participating in the defacing of Shirley Phelps-Roper's Twitter. On Wednesday, a presumed member of Anonymous called in to the David Packman Show and vowed that Anonymous has more in store for WBC. Like Anonymous, the UG Nazi team has said that they launched the hack offensive against WBC in retaliation for the group's threats against the Newtown community. If "Cosmo the God" has indeed forced his way into the Twitter accounts of WBC members, the 15-year-old hacker may have put a lot on the line. Cosmo and UG Nazi were responsible for taking down the NASDAQ website, CIA.gov, and UFC.com, among other well-publicized cyberattacks in 2012. After his arrest in June, Cosmo was effectively banned from the Internet until he turns 21. He may have violated his probation if it's actually him participating in the attacks on the WBC, Gizmodo points out. According to InformationWeek, a number of websites operated by WBC have also been downed this week this week, apparently the work of another high-profile hacker who goes by the moniker "The Jester," who in the past has launched attacks of his own against Anonymous, Wikileaks, 4chan and the Westboro Baptist Church.